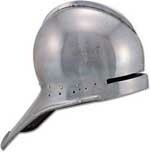 The Salet type Helmets were popular in the middle of the 15th Century. They were usually worn with a bevor and they protected the entire head. The Italian version of the salet helmet featured a long tail that covered the neck and it had a long eye slit opening. The salet type helmet was most popular in Western Europe, especially in England and Germany.